GAUGUIN ( Grouping And Using Glyphs Uncovering Individual Nuances ) is a project for the interactive visual exploration of multivariate data sets, developed for use on all major platforms (Windows, Linux, Mac). It supports a variety of methods for displaying flat-form data and hierarchically clustered data. 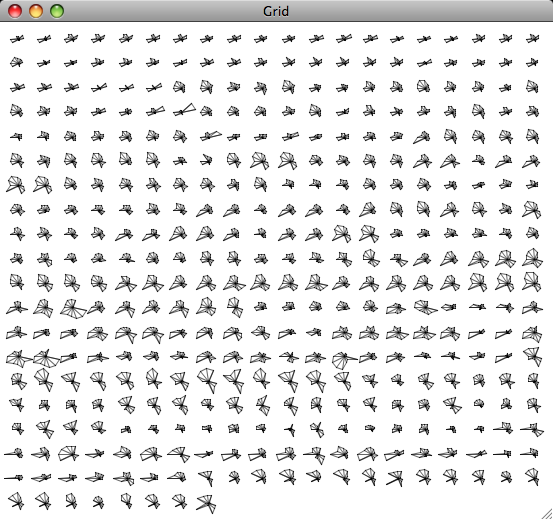 Glyphs are geometric shapes scaled by the values of dataset variables. They may be drawn for individual cases or for averages of groups or clusters of cases. GAUGUIN offers four different glyph shapes (but more could be added). The number of data elements which can be displayed simultaneously is limited, because each glyph requires a minimum amount of screen space to be viewed, but hierarchical glyphs can be drawn for groups of cases. Hierarchical glyphs are composed of a highlighted case representing the group and a band around it showing the variability of all the members of the cluster. GAUGUIN also provides scatterplots and tableplots, and via Rserve is able to use R to calculate MDS views and clusters for the data. All GAUGUIN displays are linked interactively and can be directly queried. The variable window is the most important control tool where the user can enable and disable variables, completely delete them or select and replace them. The user can decide which variables to be included in (or excluded from) multivariate distance calculations, which are used for highlighting neighbours in the grid plot. logical zooming; pressing the key “z” creates a window of the selected glyphs (at least two glyphs need to be selected) locally scaled. Groups or clusters obtained from grouping or clustering plots (see below) are accordingly highlighted in the grid plot. Distance calculations for highlighting neighboring (similar) glyphs to an individual selected glyph or to the prototype (average) of a collection of selected glyphs can be performed. The scatterplot matrix of all pairwise scatterplots of the variables selected from the list in the main variable window is graphed. The scatterplots display allows for logical zooming; clicking one of the pairwise scatterplots (only one individual plot selectable at a time) zooms in, giving a detailed view with points represented by their glyphs. Groups or clusters obtained from grouping or clustering plots are accordingly highlighted in the glyph pairwise scatterplots. Distance calculations can be performed. Multidimensional scaling (MDS) using the R functions cmdscale (metric MDS; in stats package) and isoMDS and sammon (non-metric MDS; in MASS package) on the scaled data of variables selected in the main window is performed in 2-dimensional space and the obtained configuration is displayed. The configuration points are represented by the corresponding glyphs of the original data. 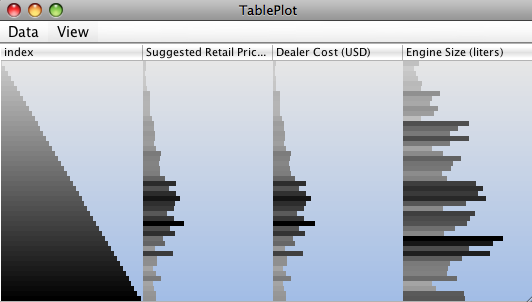 The MDS plot is generated based on the variables selected from the list of variables. A variation of the MDS plot is the center plot (Center). The latter is a special MDS plot, in which selected glyphs are displayed in the center of the plot (central view). Groups or clusters obtained from grouping or clustering plots are accordingly highlighted in these MDS plots. The plots allow for distance calculations. The data can be grouped by a given variable. There are two options, grouping by radius and grouping by count; in case of a textual variable, there is also grouping by category. Grouping by radius means that the cases are ordered with increasing value of the selected variable and then are assigned to the groups successively such that the range (max−min) of the selected variable in each group does not exceed the prespecified radius. The number of resulting groups depends on the chosen radius. Grouping by count means that the cases are ordered with increasing value of the selected variable and then are assigned to the ‘count’ many groups of, as far as possible, equal size, filling groups successively starting with the smallest value of the selected variable, in ascending order. the case are put into groups depending on their values of the selected variable. The grouping plot consists of hierarchical glyphs. They are composed of a highlighted prototype representing the group and a band around it showing the candidate glyphs of the group, as a visual measure of the variability of the members of that group. glyphs need to be selected) locally scaled, and a combination of the key “ctrl” and a mouse click creates a window approximately reproducing all the glyphs of one group. 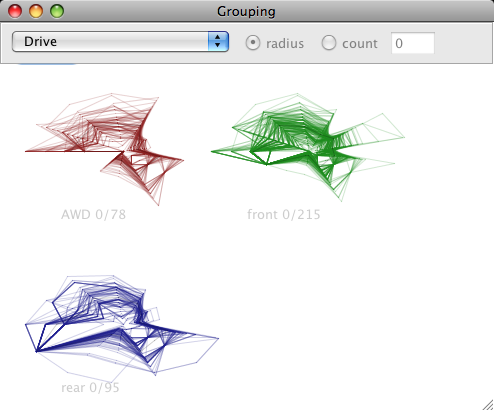 The groups are colored and distance calculations can be performed in the grouping plot. Clustering: Clustering using the R functions hcluster and Kmeans (hierarchical clustering; in amap package) and kmeans (k-means clustering; in stats package) on the data of variables selected in the main window is performed and the calculated clusters are displayed as hierarchical glyphs. The user can specify the number of clusters (groups) to be computed. The agglomeration method used for hierarchical clustering can be one of ward, single, complete, average, mcquitty, median, or centroid. Possible distance functions that can be specified are euclidean, maximum, manhattan, canberra, binary, or minkowski. The clustering plot is generated based on the variables selected from the list of variables. The clustering plot allows for logical zooming; pressing the key “z” creates a window of the selected glyphs (at least two glyphs need to be selected) locally scaled, and a combination of the key “ctrl” and a mouse click creates a window approximately reproducing all the glyphs of one cluster. 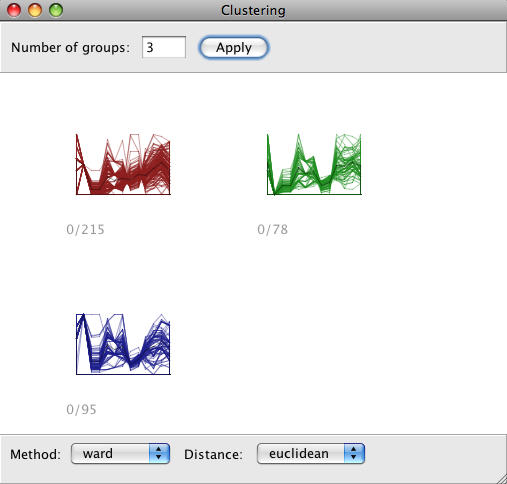 The clusters are colored and distance calculations can be performed in the clustering plot. possible to draw all cases on screen, adjacent cases are aggregated into one bar of the plot. The aggregation count or group size can be set by the user. For an aggregated continuous variable, a horizontal bar of corresponding size shows the mean value. For an aggregated categorical variable, a horizontal bar is shown, which is subdivided according to the proportion of cases within the particular aggregation group and colored respectively. By clicking a column header, the data are sorted by the variable in that column; more generally, nested sorting using more than one variable is possible. The table plot also supports such interactivity features as selection, drag and drop for column reordering, randomization of data, and zooming. In the groups plot there is one row for each group or cluster as determined by a grouping plot or clustering plot, respectively, and one column for every variable selected from the list of variables. Continuous variables are represented by histograms and categorical variables by barcharts, conditional on the groups or clusters. All plots in the same column are common scaled. 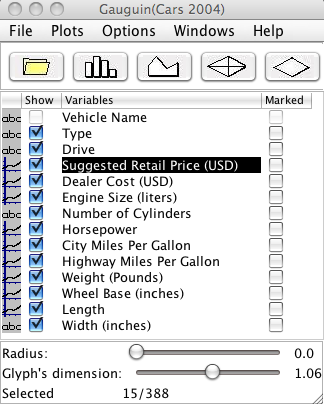 The anchorpoint and bin width for each histogram column can be set individually. This is sort of a trellis like display in which the column variables are conditioned on a row ‘variable,’ which has the groups or clusters as its categories. clicking the variables in the main variable window. factors influencing the interpretation of glyph visualizations, such as the form of glyph chosen, the variables included, the axis ordering within each glyph, glyph size, and the ordering of glyphs in the display. density of candidate glyphs of a particular group or cluster. In grouping and clustering plots the user can also specify the transparency of the group and cluster colors, respectively, through the “cursor-left” and “cursor-right” keys. This is called α-channel transparency or α-blending. may be incorporated in future versions of the software. Selection sequences allow users to combine current selections with new selections via simple Boolean operators. By storing the sequence, it is possible to modify any individual selection in the sequence at will during data analysis. Creating multiple (simultaneous) views in single or different plot windows, manually and automatically sorting and reordering categories and variables, and varying the size of points in a scatterplot are further interactive options available in Gauguin. Gauguin also allows for standard and logical zooming. The current version, however, does not support censored zooming and color brushing (persistent assignment of colors; for instance, to mark outliers more permanently). Future versions of Gauguin may provide for these additional interactivity features. 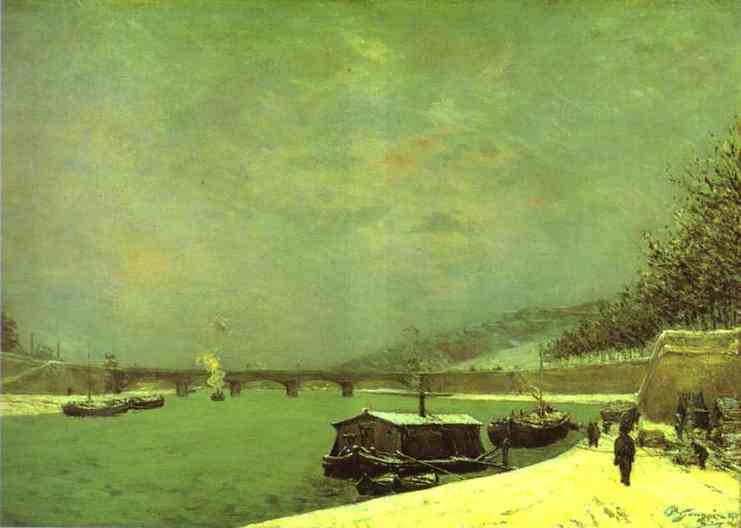 In its current version, Gauguin cannot handle missing values. Future extensions of the package could provide for graphics supporting missing data. For example, when plotting categorical data, missing values could constitute an extra group, and the associated plot object be colored white. Via Rserve, a freely accessible TCP/IP server, Gauguin can fully interact with R to enhance data analysis with statistical procedures. This interaction between Gauguin and R could provide additional plotting capabilities such as density estimation, smoothing, or other dimensionality reduction methods. Handling of categorical data: In the current version for the visualisation and calculations Gauguin replaces categorical values through numerical values. As default Gauguin enumerates each categorical value with the index according to lexicographical order, but these values can be replaced manually in barcharts. Detailled instructions on Rserve can be found here. Gauguin supports the standard ASCII data format, which consists of a header of variable names, and tab-delimited columns. specify the transparency of cluster colors.